If the classic motorcycle you’re rebuilding has been sitting for a long time, chances are good that there will be some rust inside the gas tank. 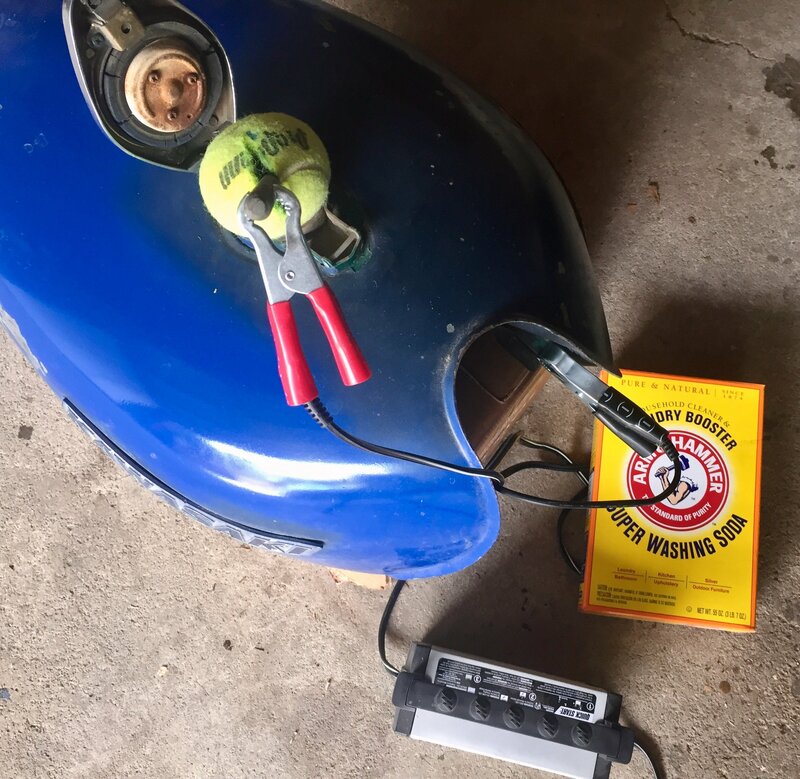 There are a number of ways to remove rust from metal, but given the limited access and difficult angles/crevices inside an old motorcycle’s gas tank, one of the easiest methods is electrolytic rust removal – especially for removing rust from the inside of the gas tank. 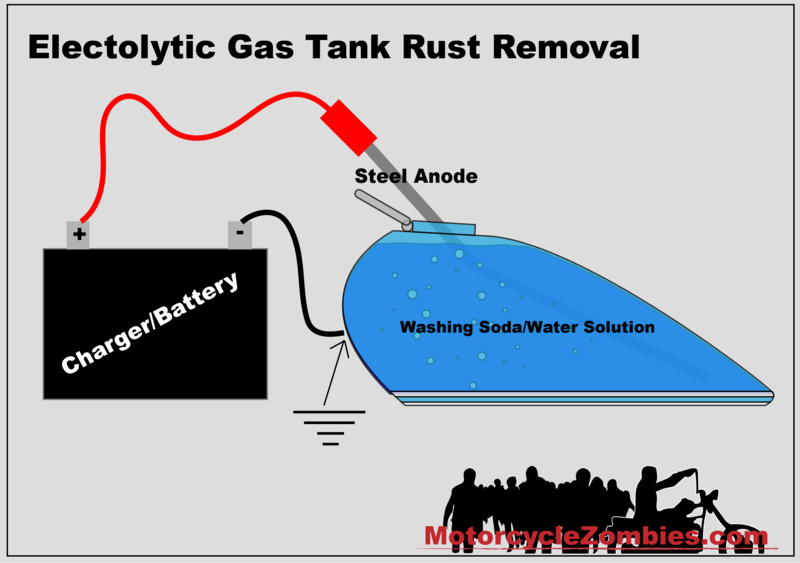 Electrolysis is one of the best ways to remove rust from a motorcycle gas tank. Arm & Hammer Washing Soda (not baking soda). Bendable steel or iron rod to be used as the sacrificial anode (do not use stainless steel as it will omit toxin during the process). You’ll also need a working battery if you’re using an automatic battery charger. In this case, you’d route the tender to the batter and run clamps from the battery to the tank and anode. Scrap wood, tennis ball, tape, etc. to hold the sacrificial anode in place. A plastic bucket or two. Functional petcock or something to plug the petcock holes. Place some loose nuts and bolts inside the old gas tank and shake them around to loosen some of the rust. Dump them out after a few good shakes. Set up your sacrificial steel anode so that it will extend into the gas tank without touching the sides. Make sure there is enough metal sticking outside of the tank that you can clamp the charger to. Use wood/old tennis ball/tape/etc. to keep the steel anode in place. It must not touch the sides of the gas tank or the process won’t work. In a large bucket mix enough water and washing soda to fill your tank. Use about a tablespoon of washing soda to every gallon of water. Stir until the washing soda has dissolved. Pour the dissolved washing soda mixture into your gas tank. Make sure the petcock or plug you used is not leaking. Grab your battery charger (and a battery if using an automatic charger). Attach the positive lead from your manual charger (or battery for automatic charger) to the sacrificial anode. Attach the negative clamp to metal on the tank – the mounts can work. Plug in your battery tender. Double check that the anode has not moved to touch the tank. If it has, adjust it so it will stay suspended inside the solution. Let the gas tank and tender sit for a few hours. Unplug the charger, unhook the positive/negative leads, and remove the sacrificial anode. If done correctly, there should be a good build up of rust that has transferred from the tank to the anode. Scrape of the rust so that the sacrificial anode is clean and repeat the process until you are satisfied with the rust removal. Drain the solution when you’re finished and swish some denatured alcohol around the tank. For automatic chargers, you’ll need to route your hookups from a battery to your tank set up. Manual chargers can connect directly to the tank. Suspend the sacrificial anode in the tank so that it doesn’t touch the sides (Tennis balls are useful here). After you’ve removed the existing major rust from your old motorcycle’s gas tank you’ll want to seal it so that it’ll stop any potential leaks and prevent further rusting. Add a 50/50 mix of water and CLR to your gas tank and swish it around for a few minutes and drain. Pour a bit a denatured alcohol to the tank, swish around, and drain. Add half the can of Red Kote to your gas tank, close the gas tank’s lid, and turn and roll the tank for a while so that the Red Kote can cover all its surfaces. The Red Kote seal will be completely dry in about 8 hours. You should wait at least 24 hours before you start using the tank. With a quality fuel tank sealant, you can rest assured that gas won’t start leaking out of tiny pinholes that may have been present and that new rust won’t form. Before you start using your refreshed gas tank, you’ll want to be sure your fuel petcock is in operating condition. Over time, old gasoline can gunk up and form a hard/sticky varnish that will clog holes and prevent the normal flow of gasoline. Refer to your motorcycle’s service manual for specific instructions on removing, dismantling, and reassembling your petcock. If your motorcycle has a manual petcock with an off position, you should replace any old o-rings. If your motorcycle has a vacuum operated petcock without an off position, you’ll likely need to replace the vacuum diaphragm. Unscrew the bolts connecting it to the bottom of the gas tank. Be careful not to lose any small washers or o-rings. Unscrew the small screws on the front and back of the petcock to expose the internals. Again, be careful not to lose any washers, screws, or o-rings. Clean any thick varnish or powdery substance that has formed. Spray the holes with carb cleaner or compressed air to make sure they’re clear. With a petcock that’s working properly, you can be sure that fuel will flow from your tank to your carbs. When the bike is off, you can be sure that fuel won’t leak into the carbs and eventually the cylinders. This all looks great, thanks. I’m going to try the electrolysis method on my Honda Vt250f2. Have you got any ideas on the petcock. I bought the bike not running. The thin diaphragm on the petcock is torn and I can’t find any replacement units or parts. It is a hard one to replace since it mates to an extension knob on the outside of the tank. Hope the electrolysis method works for you. As for the petcock diaphragm, the best bet is to look for an entire placement unit – OEM or an aftermarket that will fit.